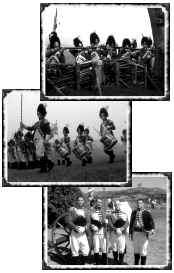 he modern Royal Newfoundland Regiment can trace its beginnings to the first Royal Newfoundland Regiment which was formed on 25 April 1795, when Captain Thomas Skinner of the Royal Engineers, the man credited with designing the defense construction on Signal Hill, was given permission to raise a fencible infantry company consisting of six hundred men. The new regiment was called the Royal Newfoundland Regiment and consisted of a number of troops from the garrison as well as local volunteers. Recruit levy money was authorized at the rate of six guineas for each new recruit while officers were enlisted from other Regiments or from notables in the town. 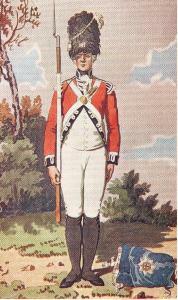 In terms of pay, clothing, arms and accouterments, the Regiment was to be on the same footing as His Majesty’s other infantry regiments in North America. A strength return for 1796 showed 35 officers and 615 men enrolled. Seventy seven of this number were stationed on Signal Hill, thirty three on South Side, five at Quiddy Viddy, and forty at Placentia. 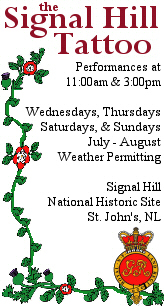 Severe shortages in accommodations at the existing town forts prompted the construction of additional barracks at both forts as well as on Signal Hill. In addition, the Regiment also began detailed plans to fortify Signal Hill by transporting guns to the face of the cliff below Gibbet Hill and by the construction of several shot furnaces for use by the batteries at Fort Frederick, Chain Rock Battery and Fort William. In September 1796 the entire garrison took to Signal Hill to help ward off an anticipated French attach led by Admiral Richery who was under orders from the Directory of Republican France to seize English fishing interests in Newfoundland. Governor Wallace assembled the Royal Newfoundland Regiment, the Royal Newfoundland Volunteers and all able bodied men from the town to Signal Hill. 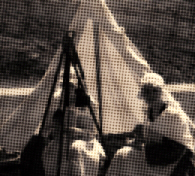 Tents were erected at the summit of the hill and at Fort Amhearst to give the appearance of a large body of troops. The French fleet landed at Bay Bulls and burned all houses in the settlement but the sight of tents erected atop Signal Hill convinced the French of the folly of an assault on St.John’s so they departed for St.Pierre taking over 60 prisoners who were later released without incident. Conditions in the Newfoundland station were harsh. The spoilage of winter food supplies stored at Signal Hill in 1797 and a fire at Fort William in 1798, that destroyed six barracks rooms and considerable stores of medicines, barrack bedding and ordnance stores, added to the privation endured by the rank and file. There were record numbers of desertions that year and open dissatisfaction among the troops. 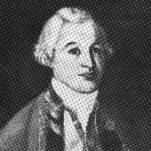 In May, 1799 Brigadier General William Skerret was appointed Commanding Officer of the troops in Newfoundland answerable to the Commander in Chief in Nova Scotia. Skerret had only recently returned from leading troops tasked with ending the armed violence in Ireland. In April, 1800 a plot was discovered among upwards of fifty members of the Royal Newfoundland Regiment who were sympathizers to the United Irish Movement, to desert their station and meet at the Powder Magazine behind Fort Townshend. Ten to twelve managed to leave Signal Hill before the alarm was sounded. Several others fled Fort Townshend but those at Fort William were prevented from leaving by a late night party hosted by Colonel Skinner. Sixteen of the mutineers were captured and five of the organizers were ordered, by General Skerret, to be hung immediatly on a makeshift gallows erected at the Powder Magazine. The remainder were sent by prison ship to Halifax. In July 1800, the rest of the Royal Newfoundland Regiment were transported to Halifax aboard the HMS Concord at the request of General Skerret who questioned the loyalty of his Regiment given that the troops were almost entirely of Irish descent. Only the Grenadier Company and the Light Infantry Companies of the Royal Newfoundland Regiment were kept in Newfoundland. In return the Duke of Kent sent the 66th Regiment of Foot to Newfoundland. The remainder of the mutineers were forced to march behind their own coffins en route to Fort George on Citadel Hill. Eight of the convicts were spared at the last moment and given life sentences and three more were summarily hung in front of the entire garrison. For the next two years the Royal Newfoundland Regiment provided garrison duties in Halifax. In March, 1802 with the signing of the Treaty of Amiens the war with France ended. By August, the Royal Newfoundland Regiment had returned to Newfoundland and were promptly disbanded along with other fencible regiments that had been raised to meet the impending crisis. 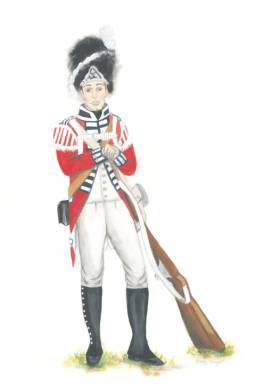 The uniform of the private soldier and non-commissioned officer of the Royal Newfoundland Regiment of Foot in 1795 was comprised of a headdress, coat, small-clothes, and footwear. The headdress worn on parade and in battle was the bearskin cap with tussle and plume. In the center was the Latin cypher or grenadier motto 'difficulties do not daunt'. For fatigue duties and in camp, the forage undress is worn which consists of cloth beret, shell jacket, trousers, and shoes. The coat was made from heavy melton wool. The body and arms were red, and the cuffs, collar and lapels were blue. Lace surrounded the button holes on the lapels and cuffs while the buttons were made of pewter. The coat was also lined with a lighter white wool. The soldier's smallclothes consisted of the waistcoat and breeches. Both garments were made of melton wool of somewhat lighter weight than the coat material. Both garments were also lined with natural linen. The shirt was made of fine, white linen. Around the neck a stock of leather was worn be protect the soldier's neck and keep his posture straight. Footwear was a buckled shoe with rough-side outwards and plain brass buckles. Stockings were made of lightweight cotton for dress occasions or coarse cotton or wool for use in the field or garrison. The leg was covered with gaiters protect from abrasions and prevent pebbles and other debris from entering the shoe on the march. 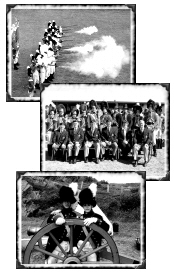 Soldiers in the Royal Newfoundland Regiment of Foot were issued the India Pattern Brown Bess Musket. Each private soldier carried his bayonet in a scabbard hanging over his right shoulder. Ammunition was carried in a cartridge box slung from the left shoulder and resting on the right hip. The box itself was constructed of heavy, black leather with a reversible wooden block inside containing a total of 36 cartridges of musket ammunition. The cartridge box is suspended by a buff leather strap. On the march and on campaign, each private soldier was issued a haversack made of natural linen and suspended from the right shoulder onto the left hip. Sitting on top of the haversack, a tin canteen was suspended by a hemp cord. On the back, a knapsack constructed of heavy canvas with buff leather straps was used to carry the soldier's spare clothing, toiletries and other personal possessions. 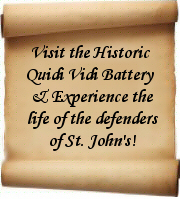 At the outset the Royal Newfoundland Regiment of Foot was billeted in houses about St. John's. Eventually additional barracks were constructed at both Fort Townsend, Fort William and on Signal Hill sufficient to house the entire Regiment. In the spring and summer of 1796 the Regiment was known to have been billeted in tents similar to those represented here today. The garrison would have been supplied with equipment like this to use in the field. As no barracks remain at Signal Hill the Tattoo use field equipment to demonstrate some of the more domestic aspects of a soldier's life. Neither barracks, billets nor tents had anything much to commend them, for overcrowding was rife in each. Soldiers were routinely discouraged from marrying but many did so, and the regulations allowed six wives and their children per company to be carried on the ration rolls in return for hospital or other work. These camp followers of the British Army, commonly referred to as distaff, were family members of the officers and soldiers. hese wives and daughters of officers and soldiers would have owned plain, serviceable clothes, suited for life with an army on the move. These women received half pay and half rations for services rendered, such as laundry, mending, nursing, and tending to the baggage train during troop relocations. It is known that the men rarely got paid in cash in the colonies. The Companies kept debit and credit books and uniforms for the men, shoes bought for wives, etc. were debited from the soldier's pay. Women did washing for the men for pay, but in some cases, the payment was debited from the soldier's account to her account or her husband's.